 After your breakfast, we meet you in your accommodation in Marrakech and depart for the Ouzoud cascades in the Middle Atlas Mountains. This 110 metres high three tiered waterfall is quite spectacular and possibly one of the most beautiful in all of Morocco. The sunlight across the spray from the falls creates multi layered rainbows and you can take a raft ride to the base of the falls to experience its wonder and the power of nature. There are also guided walks to explore and discover this beautiful location. You may well see the indigenous Barbary monkeys that come to feed here. Lunch can also be taken in full view of the cascades and of course there are many photo opportunities. After the visit to the falls, we drive across the forested terrain in the Atlas to the picturesque Bin el Ouidane lake and then across to the village of Imilchil where we spend the night with half board. The story goes that the young lovers Tislit and Isli, unable to marry because of their feuding tribal families and not wishing to live without each other, decided to drown themselves in two nearby lakes, although legend says it was their tears that filled the lakes. But even in death they remained apart as a mountain separated their lakes and thus prevented their souls from meeting in the afterlife.If you are feeling adventurous, you can take a day trek and walk the 7km between these two lakes and imagine the romantic yet tragic story. We can organise a picnic lunch and a pick up if you get too tired. In September there is an annual festival of marriage where local tribes come together and the women get to choose their partner. After breakfast, we leave Imilchil and drive south to the Dades Gorge; we pass through Berber villages and stunning countryside where locals are friendly as they go about their daily tasks. At the fork in the road at Agoudal, we take the option for the Dades Gorge. This is an impressive landscape with some amazing eroded formations and rose coloured mountains. The river valleys are full of old adobe kasbahs and rich farmland. We spend the night here in a local guesthouse with half board. After breakfast, we leave this wonderful gorge and discover another one further along the valley. In Tinghir, we take the road up to the Todra Gorge; a favourite place for international rock climbers as it boasts a 300 metre vertical fault with a crystalline glacial river running through it. This pink tinted canyon is only 10 metres wide at its narrowest point and was formed by glacial activity. Nomads can be seen with their donkey filling up water containers. 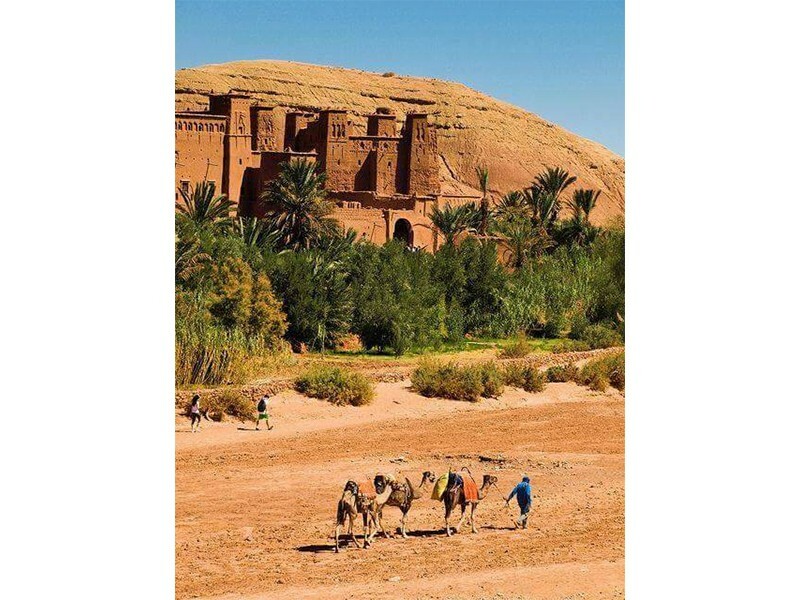 After a lunch break here, we continue south passing through palm groves and Berber villages with adobe kasbahs until the landscape changes and the Sahara sands welcome us to the Erg Chebbi dunes and Merzouga. 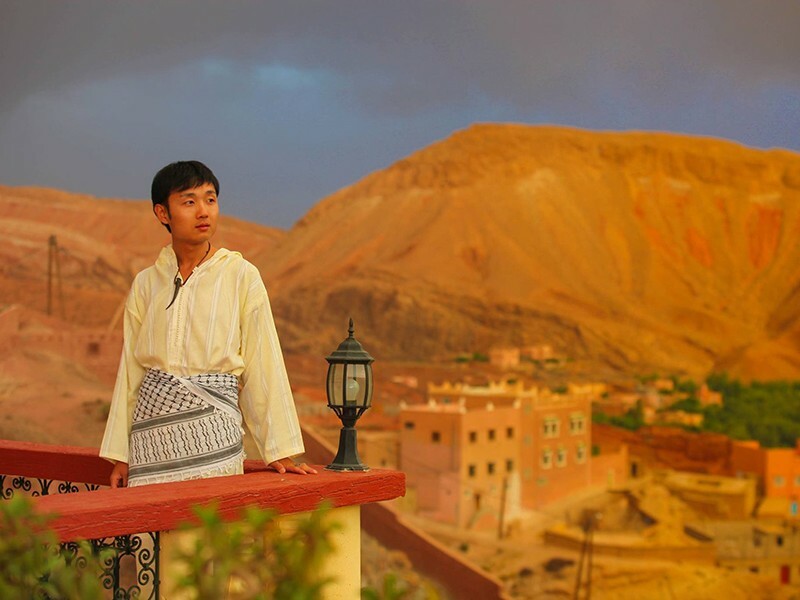 Here after a welcome mint tea, we will enjoy the sun setting on a camel ride across the dunes to our nomadic style camp where dinner and local music are served up under a star filled sky. If you wake up early enough, you can enjoy the magic of a desert sunrise; a very special time and an experience you will always remember. We return by camel to the hotel for breakfast and to freshen up. Our adventure continues as we discover the market town of Rissani, and the desert towns of Alnif and Nkob with its beautiful kasbahs. We will stop for lunch here and in the afternoon take the off road option to meet the mighty Draa Valley with its vast palm oasis and ancient lifestyle. In the ksar of Agdz we will spend the night with half board. From Agdz, in the heart of the palm groves of the mighty Draa Valley, we drive north, with the Saghro Mountains on our right and the Atlas Mountains ahead of us. We reach the Hollywood of Africa; Ouarzazate, home to the film studios and famous film sets for movies like the Mummy and Cleopatra. 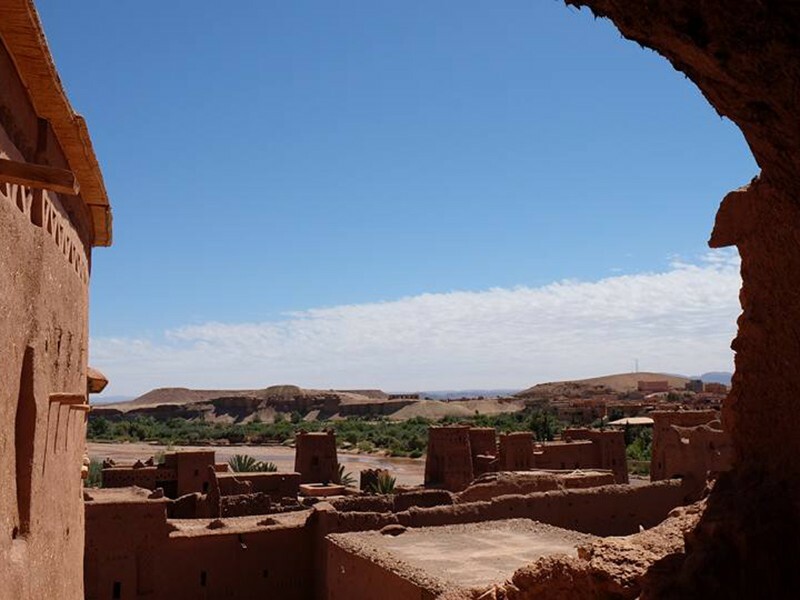 We go off the road then to visit the other famous filming location; Ait Benhaddou, where the Gladiator was made. This adobe fortress ksar is an important stronghold on the old caravan routes that traded salt all the way to Timbuktu. We will have lunch here and take a short visit. We drive over the High Atlas Mountains crossing the 2260 metre high pass at Tizi n´Tichka before descending to the plains of Haouz and the medina of Marrakech.